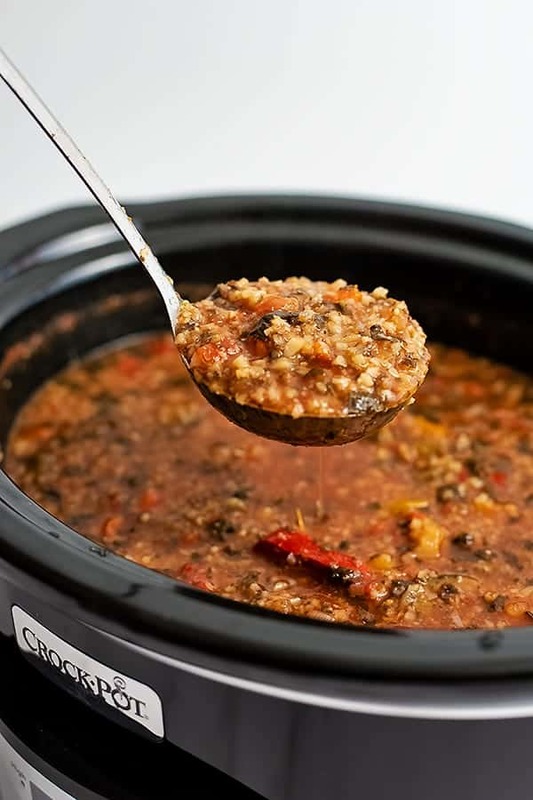 This crockpot low carb vegetable soup is sure to become one of your favorite simple healthy soup recipes! Since it cooks all day in the slow cooker, this soup is perfect for busy weeknights or warming up on a cold day! 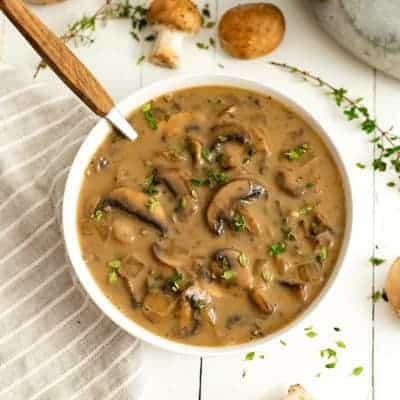 You will not believe how many veggies are packed into this vegan, gluten free, dairy free, low carb, paleo and Whole30 soup! Soup is one of those comfort foods you just crave in the winter time! It’s simple to make and can instantly make you feel like you are getting a warm hug from the inside! 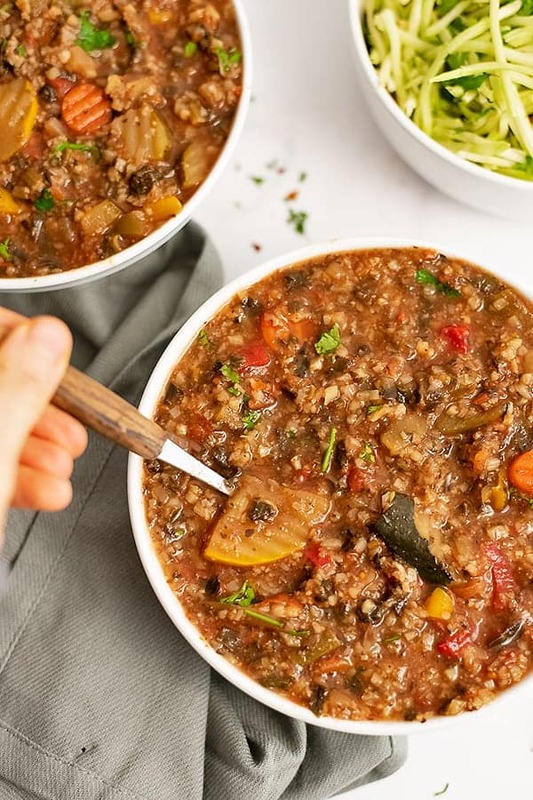 This recipe for crockpot low carb vegetable soup takes the classic veggie soup recipe you know and love and adds in even more veggies to help you stay full and satisfied while staying low on carbs! 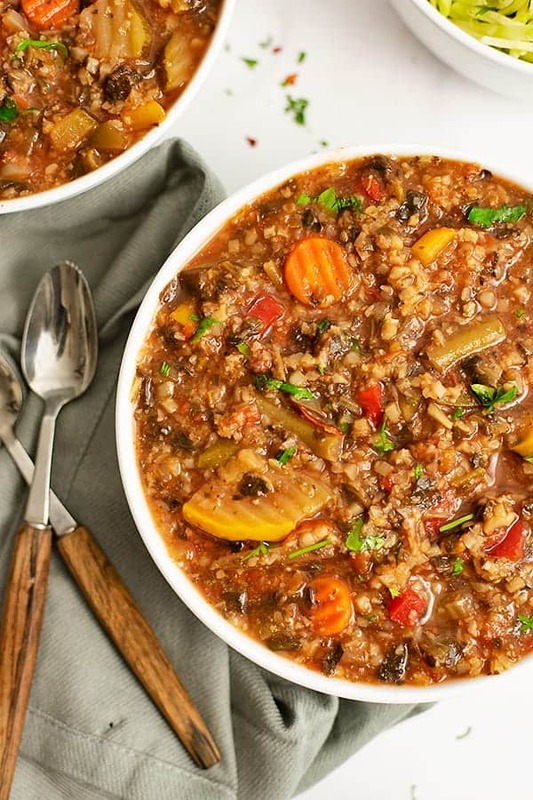 Packed with flavor from the Italian seasoning and balsamic vinegar, this soup will have everyone asking for seconds! You are going to love this recipe because it requires minimal prep. All you have to do is chop up an onion (and you can omit that if you are really short on time). 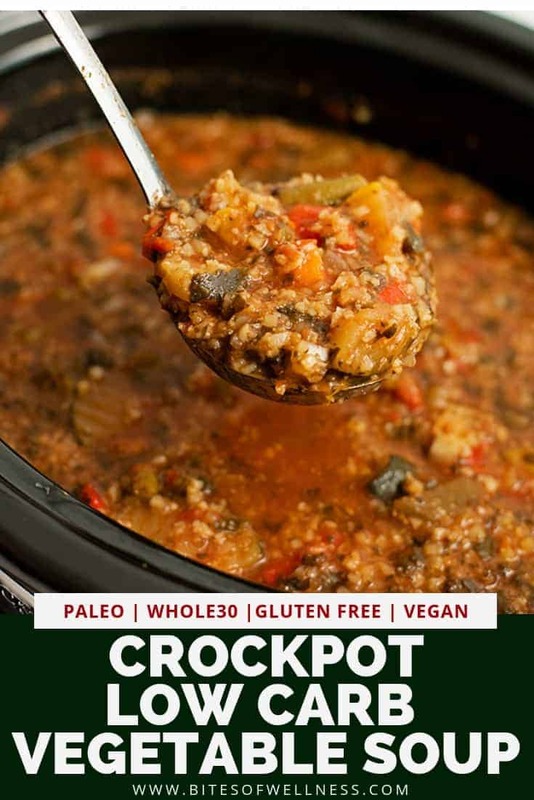 Just throw all the ingredients in your crockpot (affiliate) and let them cook while you are at work or out running errands. 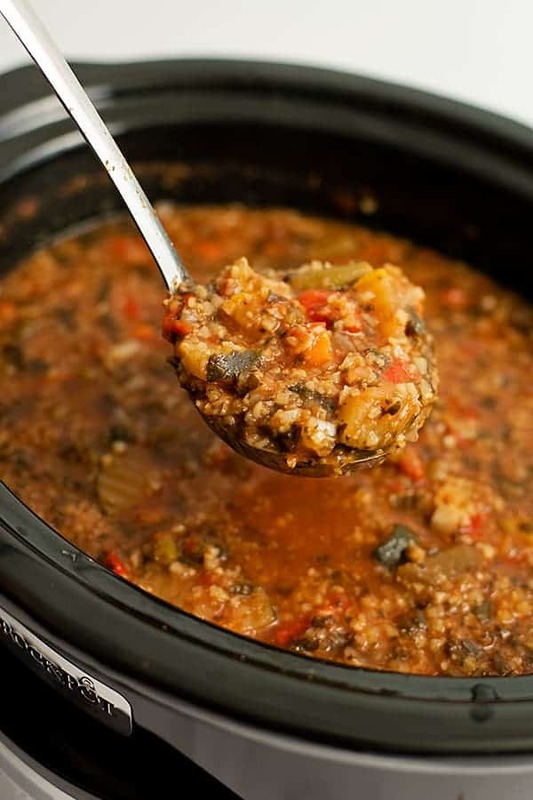 Stir the ingredients in the slow cooker to make sure everything is combined and cook on low for 8-10 hours (or high for 4-6). 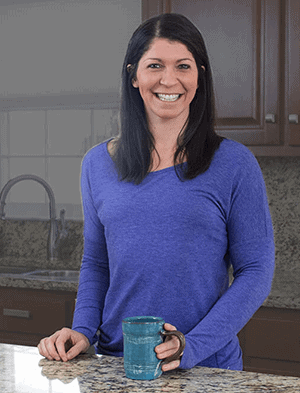 This vegetable soup is low in carbs and calories and is packed full of fiber and water! Starting a meal with a broth and vegetable soup can help lower your overall calorie intake and also increase your serving of vegetables in the meal, helping you feel full on less calories. Also because soup is served hot and requires you to slowly eat it, it forces you to slow down during your meal, helping your hunger signals reach your brain by the end of your meal instead of 10 minutes after your meal. 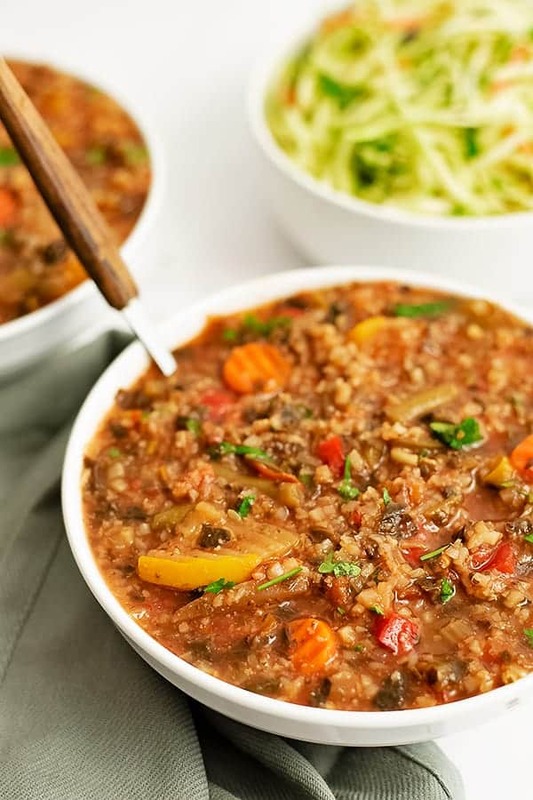 This is the easiest vegetable soup to make! See just how easy it is to make in the video below. 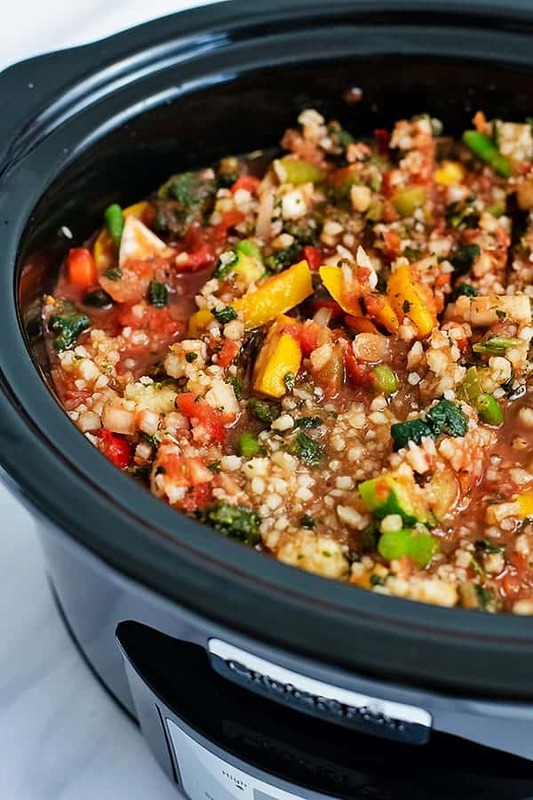 Crockpot low carb vegetable soup is a simple slow cooker recipe that is requires little prep and is the perfect weeknight dinner. 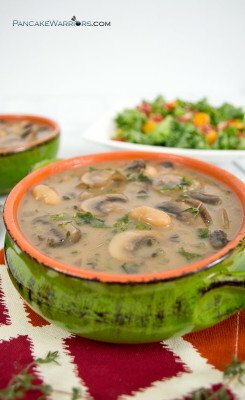 This vegan, gluten free, paleo, Whole30 soup is the perfect comfort food!